Anna Apple growing tree of the genus Malus also known as Apple Ana tree, Anna Apple perennial deciduous plant, can grow in mediterranean, subtropical or temperate climate and growing in hardiness zone 5-11. 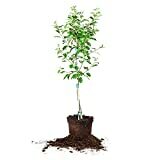 (5 Gallon Bare-Root Set of TWO plants) ANNA APPLE trees,Fruit are medium to large in size, with green skin overlaid with red, crisp, good flavor, and ripens early. (3 Gallon Bare-Root) ANNA APPLE tree,Fruit are medium to large in size, with green skin overlaid with red, crisp, good flavor, and ripens early. Is it necessary to graft in Anna Apple? What can be done with big quantities of Anna Apple fruits?